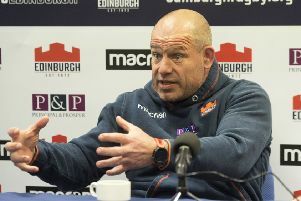 England last night accused Scotland of sparking the scuffle that broke out in the tunnel ahead of Saturday’s Calcutta Cup match at BT Murrayfield as Six Nations Rugby contacted the RFU and SRU for an explanation. Both governing bodies have been asked to provide their accounts of the flare-up that took place shortly before Gregor Townsend’s men recorded a 25-13 victory over their rivals. Video footage appeared to show a clash between England’s Owen Farrell and Scotland No. 8 Ryan Wilson, with team-mates needing to separate the pair. The incident unfolded as the two teams left the pitch and entered the tunnel area after completing their warm-ups. A Six Nations spokesperson confiremd that both unions would be asked to provide clarification on what took place in the tunnel. Once the unions have responded, tournament chiefs will decide whether to launch an investigation or take disciplinary action. When the scuffle was picked up by broadcasters during the interval, Martin Johnson quipped in his role as pundit that it was “England’s highlight so far I think”. According to reports this morning, the RFU will tell Six Nations Rugby that Farrell was not to blame for the altercation and was “provoked”.